Pseudoxanthoma elasticum (PXE) is a rare disorder of the connective tissue of the body. About 85% of patients with PXE develop eye problems, often in their twenties or thirties. Low vision is a reduction in the standard of vision which causes a substantial and permanent handicap, and which cannot be corrected with spectacles or contact lenses. It is also known as partial sight and sometimes sub-normal vision. Those of you who have experienced visual loss will remember what a shock it was at the beginning. There you were, leading a normal life, driving, working, socialising, taking your good vision for granted as we all do. Suddenly, almost overnight it seemed, your vision changed, you could no longer follow your normal routine, and somehow you had to come to terms with the situation. You may have gone through several different emotions. Initially denial, then anger, perhaps anxiety or even low expectations of what could be done to help. Dispensing opticians who specialise in low vision work carry out low vision assessment to ascertain the extent of the visual problem, how it is affecting your life, which aids can help and how to use them, and recommend practical ways to maximise your visual ability. If you wear spectacles we will advise you whether or not you need to wear them with the magnifier and whether they should be long distance glasses, reading glasses or both. Certain types of spectacles will make using a magnifier more difficult, you may be having trouble seeing your computer or cctv screen because you are wearing the wrong glasses or are using them at the wrong distance from the screen. Some dispensing opticians work in hospitals, some in private practice but wherever it takes place a proper low vision assessment will not be rushed. We will ask you to bring along things you are having difficulty seeing and discuss with you the various options, before deciding on the aids to recommend, to ensure that you obtain the best kind of help, sufficient time will be spent demonstrating different types of aids and relatives and carers are encouraged to sit in during demonstration so that they can appreciate the way the units work. Registration as blind or partially-sighted is dependent upon the standard of vision which you can achieve. It is voluntary but does have advantages. Patients are referred for registration by their GP, optician, social worker or even self-referred. A five-part form (the BD8) is completed by the consultant ophthalmologist and signed by the patient. It gives details of the standard of vision, the cause and duration of sight loss and other relevant information. One copy is kept by the hospital, one goes to the patient, one to the GP, one to Social Services and one to the Office of Population, Censuses and Surveys. The purpose of this dissemination of information is to alert the relevant authorities to the patient's visual situation and possible special needs. The Department of Education & Employment is notified by Social Services. Full details of the help and concessions available through registration are available from social services, but there are non-statutory benefits including travel concessions, talking books, library services for Braille and Moon, and help with telephone installation and rental charges through the Telephones for the Blind Fund, the British wireless for the Blind Fund, will supply a radio and a limited supply of batteries on free permanent loan. Statutory benefits include parking and travel concessions. A special windscreen badge entitles the holder and driver to extra parking time at meters free of charge and for up to two hours on double yellow lines. There are concessionary fares on trains, buses and coaches. Also postal concessions, increased personal allowances for blind people who pay income tax, income support payments and a disability premium. Pension payments may be higher and people of working age looking for work are entitled to retraining and re-settlement services. VAT is not payable on aids specific to a person's disability so low vision aids purchased privately will be vat-free. HOW DOES PXE AFFECT THE EYE? One part which may be affected is the macula. If you imagine that the eye is like a camera and the macula - the central part of the back of the eye - is like a film, then if the film is damaged you will never get a good picture, even if the camera is perfect. If the macula is damaged you may experience a central loss of vision or black spots wherever you look. Some people may have problems recognising people's faces or difficulty reading a map or there may seem to be a bit of vision missing when you are reading a newspaper. So what can be done to help? A low vision aid can be defined as something which helps a patient with low vision - from a magnifying glass to a handrail in a dark corridor. There are many different types of low vision aids available. Optical aids are those which incorporate focusing lenses and include magnifiers of many types. There are different ones for reading and long distance vision. Some are held by hand, with or without their own light, and are useful for short periods of use. Free standing magnifiers stand on the page, leaving the hands free. There are even special magnifiers that can be attached to your spectacles. Electronic aids include closed circuit television systems. Some of these can make things look up to 100 times bigger. There is also a whole range of non-optical aids, designed to make life that little bit easier. There are tinted lenses, watches with raised numbers, big number telephones, large print books and newspapers, large print playing cards, talking calculators and many more. Colour and contrast can be varied - avoid serving white food on white plates, but the level of black coffee will be easier to see in a white cup. You can also buy a little device that sits on the edge of the cup as you pour and buzzes when the cup is full. If your kitchen is white with bright fluorescent lighting this can cause a lot of glare. Matt pastel walls with contrasting worktops will improve the contrast and diffusing covers will soften fluorescent strip lights. Low level lighting just above and to the back of worktops can also help. You may be having trouble seeing the television. One simple but effective way to see tv more easily is to sit at half the distance and the picture will look twice as big. If you can use a larger tv, say with twice the screen area, this will also double the picture size. There are special telescopic magnifiers which double the image so if you combine all three methods, you will have a picture eight times larger. If you keep your original television, sitting at half the distance and using the telescopic magnifier will give you a picture four times the size. People often ask why we use magnification? 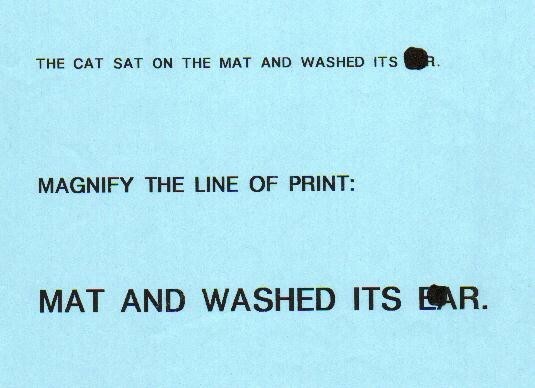 Well, suppose you are trying to read this sentence: the cat sat on the mat and washed its ear. There seems to be a bit of the last word missing or covered by a black spot. When we magnify the sentence we enlarge the words but not the spot, so now you can see the word is ear. Your first view through a magnifier may be strange - distortion around the edges and difficulty in reading a whole line - but with a little perseverance and the right type of magnifier it will become easier. There are simple hand held magnifiers, handy for reading a letter or a recipe. A knitting or chest magnifier is worn around the neck, leaving the hands free to knit or sew. Some that have a built-in light and there are little torch magnifiers which are useful for shopping, also pocket magnifiers very discreet - and useful for reading prices. Some magnifiers sit on a table, handy for reading and writing or crosswords. There are lenses which clip on to your own spectacles and leave the hands free and are useful for hobbies such as painting or stamp collecting. There are other types of magnifiers which leave the hands free and may incorporate your spectacle prescription. Some give a high amount of magnification and are held very close to the page. Some are telescopic and do not have to be used so close. You may not have seen these types before because they can only be supplied by registered opticians. There are also special strong half-eye reading glasses which some people find very useful. The right kind of lighting is very important to help you make the most of your vision. A small 60w lamp placed close to the book or newspaper will seem much brighter than a 100w lamp high up in the ceiling or a shaded standard lamp behind an armchair. When you are at home, try positioning a lamp close to the page, turn it on, and look at the smallest size print you can read, then turn the lamp off. Suddenly you will find you cannot read that small print any more. Using good illumination will often reduce the need for magnification. When you are out and about, seeing bus numbers can be difficult. A little telescope can be mounted on a ring for convenience. Bigger telescopes, called monoculars, can make things look eight times normal size and are useful for train indicator signs or the long lists of departments outside hospitals. A CCTV has its own monitor and can be used for reading and writing. You can use black print on a white background or reverse it for white print on a black background, which some people find more comfortable to read. There are black and white and colour versions. They can help you see to write cheques, look at photographs and read curved surfaces too, such as medicine bottles and tins of food. Another system uses a mouse for scanning and connects to your own TV or computer.